On my iPhone (s aapl) and iPad, I have to sign in to two different Apple IDs in order to get everything set up the way it should be. There’s my oldest Apple ID and iTunes account, which I’ve long used for making purchases through the iTunes and App Stores, and there’s my MobileMe account, which will soon become an iCloud ID. 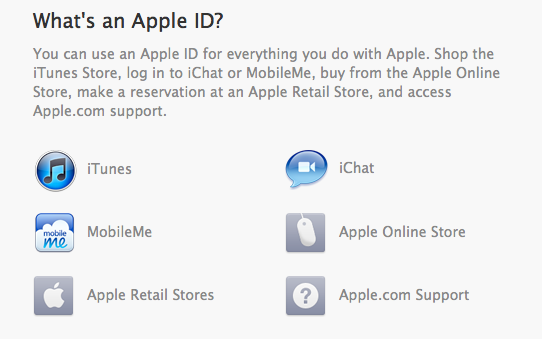 If I could just make my @me.com account my sign-in email for my existing Apple ID, all would be well. But this is not possible. Thankfully, there’s new reason to hope that may change. Apple doesn’t allow you to change the login or your Apple ID, or merge two separate IDs, even if you can easily prove that they both belong to one individual. If I want to re-download the thousands of dollars worth of apps (it’s likely in that range by now) I’ve purchased for my iPhones, iPads, iPods and Macs over the years through Apple’s official App Stores, I have to use my legacy Apple ID, which is associated with a Hotmail (s msft)address I never actually use anymore. But to take advantage of cloud email, contact and calendar syncing, I need to use my Mobile Me ID. I also like to use that ID for FaceTime and Messages, since it’s the email address where people would assume I’d receive those kinds of communications. The headache of multiple sign-ins is about to get a whole lot worse when iCloud and iTunes Match arrive this fall. Automatic Downloads, which lets you download all purchases of iTunes music, apps and books to all your devices automatically, already prevents users from switching iTunes accounts for 90 days, and iTunes Match will actually remove your on-device library if you change to another Apple ID for the on-device store account. If you want to use your Me.com address (provided free with iCloud) to use iTunes Match, you won’t be able to switch to any other account to download previously purchased apps without incurring major inconvenience. Luckily, one reader who emailed Apple CEO Tim Cook about the problem of multiple Apple IDs received a response from Apple’s executive relations team by phone, indicating that Apple is working on the issue, according to MacRumors. She acknowledged that as of yet, you can’t combine accounts, but that the Apple ID team is working on it. A second concerned customer reportedly received the same info after emailing Cook about the same issue. Apple’s shift to the cloud holds a lot of promise in terms of simplifying getting content onto and off of mobile devices like the iPhone and iPad, but single sign-on access to all your content and services is a crucial component of making sure that process is easy and not confusing. If Apple wants to be less flexible about how and when you can use your Apple ID, then it has to be more flexible about making changes to the ID itself, so let’s hope this is a priority for Apple ahead of its iCloud launch. I can’t tell you how much I HATE iTunes match right now! Complete DAYS of wasted time, failure and frustration with Step 3 in the upload process of 70gb conflicts between two Apple IDs, purchased DRM music by me, using the same credit card etc… Now I’m locked out iTunes Match using my primary iTunes Apple ID until 1/17/12 due to bad advice from Apple’s Senior Tech Support this week with no recourse except a refund and then the inability to use iTunes Match for 12 months with that Apple ID. I feel cheated and angry. What is CEO Tim Cook’s email address? this would be amazing. I want it so I can have a master ID then set sub ID’s for family members. With the current setup, my mother was receiving my iMessages (Strange?) and my iPad says it can’t change Apple ID’s yet I’ve never changed it on the iPad. Somethings not right. Good to hear ! Hopefully they really merge it ! You can change that old hotmail email that you use with your iTunes account, even the login username/email I have done that before and just recently for my sister when she changed her email address after years of using iTunes. Fingers crossed that this happens. I too have a legacy Apple ID along with .mac and .me IDs. The latter two should be interchangeable but that doesn’t always seem to be the case. I don’t know about you, but I use the exact same @me.com email address to login to both iTunes for purchases, and my MobileMe account. Some of us made Apple IDs long before we purchased MobileMe. I for one, attached my Hotmail to my Apple ID several years ago when I first got iTunes. Two years ago I purchased MobileMe and now I’ve got both IDs. I’m in the exact same boat as the author on this issue!